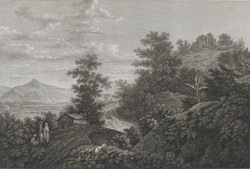 Engraving of the pass of Sicri Gully by William Angus (1752-1821) after William Hodges (1744-1797). Plate 3 of William Hodges 'Travels in India, during the years 1780, 1781, 1782, & 1783' published in London in 1793. The village of Sakrigali is situated on the Ganges and lies at the base of the Rajmahal Hills. The top of the first promontory, which forms the boundary between Bengal and Bihar, is known as the Pass of Sakrigali. On top of the hill, Hodges noted that there was a ruined tomb of a Muslim Saint.